Universal's Volcano Bay water park photographed from an aerial position on May 23, 2017. 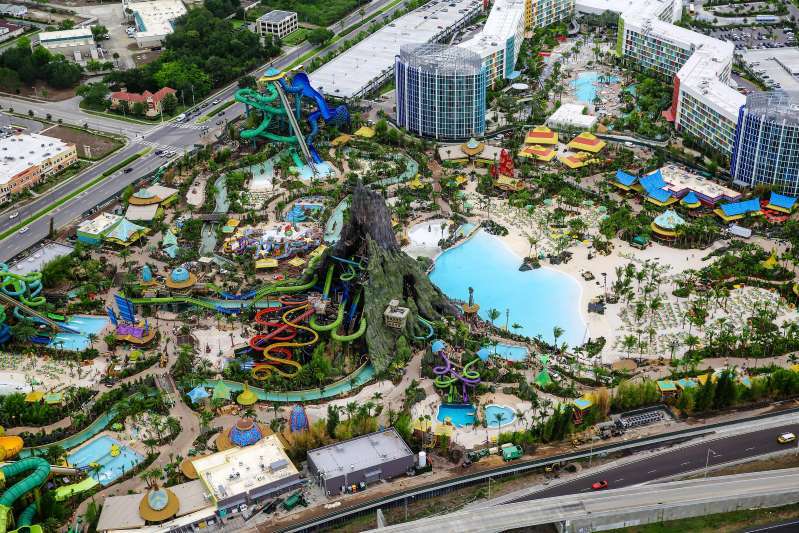 In recent months, Universal has acquired hundreds of acres of land along Sand Lake Road for what could be an addition to its current theme parks: Islands of Adventure, Universal Studios Florida and Volcano Bay water park. Comcast executives in July gave a glimpse of how much they hope to amp up a war with Walt Disney World as they hinted at a possible name for a fourth theme park they believe would make Universal Orlando Resort destination for a week-long stay. In a question-and-answer session July 26, an analyst inquired about a patent application filed last month for the name "Fantastic Worlds." The application said the name was for "entertainment services in the nature of amusement park and theme park services." [post_ads]"Is that any indication you're planning another gate (theme park) in Orlando? Could you talk about plans and timing on that?" asked an analyst from Bank of America Merrill Lynch. "We are looking at it," a Comcast executive said, confirming the company filed the name registration. "We love the theme park business. It's one of our best, most consistent businesses. "We think we have a lot of very long runway. Another gate in Florida would have the advantage of turning Florida from a two- or three-day destination to potentially a week-long destination. We think that would be attractive." The comments show Universal is in the fight with Disney over getting guests to stay longer, said Dennis Speigel, president of the Ohio-based International Theme Park Services. "They are upping the game," he said, adding that Universal is declaring, "We're No. 2, but we're moving strong." The name Fantastic Worlds would be a more encompassing, "expansive" choice for a theme park and might include Nintendo-related attractions, Speigel added. NBCUniversal announced in 2016 that it planned to build Nintendo lands in Orlando, California and Japan in the future. In recent months, Universal has been acquiring hundreds of acres of land along Sand Lake Road for what could be an addition to its current theme parks: Islands of Adventure, Universal Studios Florida and Volcano Bay water park. Universal is also a few weeks away from opening its newest hotel, Aventura, and will have 6,000 hotel rooms "with still more capacity to grow" - about 2.5 times the number of rooms from five years ago, Comcast executives said Thursday. Theme park operations helped NBCUniversal offset its declining film division as its revenues fell flat at $8.3 billion, Comcast also revealed Thursday in releasing its second quarter financial results. Theme parks generated about $1.36 billion in the second quarter, up nearly 4 percent from the same time in 2017. The division's revenue is up about 9 percent in the first half of 2018 compared to 2017. The company's filmed entertainment division generated $1.7 billion, a 20 percent drop from the second quarter of 2017. Comcast owns Universal Orlando parent NBCUniversal.